Friday night Zak Bucia will defend his recently-earned Shamrock FC welterweight title against local favorite Aaron Highfill. A victory would not only solidify Bucia's place as one of the top 170-pounders in the Midwest but would also give him an opportunity to sign with Bellator. All SFC champions are rewarded after their successful first title defense with an option to sign a multi-fight contract with the organization. If successful and if he chooses to jump ship, Bucia will join previous Shamrock FC belt holders Rebecca Ruth (flyweight), Jordan Howard (bantamweight), Rudy Bears (lightweight), and Bobby Brents (heavyweight) who have transcended to Bellator. Ruth won her Bellator debut on a televised main card by decision over Lena Ovchynnikova. She lost in June 2016 to Ilima-Lei Macfarlane. Bears has fought twice, including on the main card, losing to Michael Venom Page and Neiman Gracie. Brents lost a split decision to Chase Gormley in October 2016 and was cut by the promotion afterward. Howard recently earned his first Bellator win in July with a wicked KO of Johnny Marigo in the first round. "This opportunity is really big," Bucia said. "But I can't go out there and think about it." Bucia, 32, is 16-8 and he boasts a long pro career that began in 2007. In martial arts since he was a child, Bucia left Kansas at the age of 18 for San Francisco and set forth on a combat sports path that led him to China, Brazil, Thailand and an assortment of locations stateside, including fighting two times for Strikeforce in 2009. When it came to grappling, in the early days, it was Bucia all by himself other than some videos. Then began an odyssey that included stops with Kurt Osiander at Ralph Gracie BJJ while in San Francisco, one year in Vegas at Wanderlei Silva's fight team, and another year training in Brazil. Bucia earned the SFC welterweight belt with a unanimous decision win over Bobby Voelker in May. In Highfill, Bucia will face a younger version of Voelker. "Aaron kind of reminds me of Bobby," Bucia said. "Both are big dudes, and they like to push forward pretty hard, and that's OK with me. Aaron has that overhand right that he throws well and he throws it a lot." Bucia was awarded his BJJ brown belt this year and is known for his whirlwind offense that his heavy on combinations. "I don't know if he can handle that," Bucia said about his offensive firepower. "He is not going to be easy to put down, but I am confident in my ability." Bucia has been running his fight team at Lawrence Fight Club. In other action on the main card, Jordan Dowdy will face Ty Flores at a catchweight of 180-pounds. Flores, usually a middleweight, is coming off a rough KO loss to Highfill, whereas Dowdy snapped a two-fight skid with a win over Joel Blair in April. "I took a couple steps up in competition very early that others turned down in Adam Meredith and Bomba," Dowdy said. "Those were big opportunities that just didn't go my way, so my record is not a reflection of my skill set. I'm currently 4-1 as a pro in Shamrock FC, it's the Bellator fights that set me back. At the same time, it was a gut check and I had to prove a point in that last fight." Dowdy now 4-3, looked as good as ever in his bout with Blair, in which he took down the kickboxer with a granite chin and submitted him in the second round. "Since that fight, training has been more fun," Dowdy said. "I've added even more skills, and the work with my strength and conditioning coach George Stanich has reached new levels. When the training became fun again after that fight, everything just seemed to flow better and elevate naturally." Typically a welterweight, Dowdy makes a massive cut to 170 from nearly 200 pounds. "The cut to 180 is much easier on me for sure," Dowdy said. "I definitely am not as drawn out, my family and friends are enjoying the process more as well because they hate everything about me cutting down to 170. To explain weight cutting to people not in the know, they think it's the dumbest thing to do to yourself, and at times I really can't blame them for thinking that." Already a cardio machine, it will be interesting to see what impact this has on Dowdy's performance on Friday. "I think my performance will show the difference," Dowdy said. "Generally, there is a lot of rehydrating I have to do to get my body back to functioning properly. This time, I will not be as drawn out and will not take a hit on conditioning. A large weight cut, even despite the best of your preparations, comes with a backlash. I'm excited to feel the difference tomorrow." Flores (2-2) started his career with wins over Chad Williams and Colby Tierney but has since dropped two-straight. Malcolm Smith and Brandon Lowe (2-1) will meet in a clash of talented lightweights. Knuckle Junkies profiled Lowe and got his thoughts on the matchup in a story earlier this week that you can read HERE. Sean Woodson (3-0) is putting together the kind of year that could garner him several votes for STL MMA Regional Fighter of the Year. The rangy, boxing-centric Woodson has wins over Coltin Cole and Rashard Lovelace (the 2016 Regional Pro of the Year). Basler (3-4) is a hard-scrabble fighter from Southern Illinois whose journey back to redemption has had some potholes, but he keeps pushing through. You can read more about Basler in this KJ profile published on Monday. AJ Siscoe (2-1) returns to action against Juan Parra (0-3) in a bantamweight bout. Parra has been inactive for over three years and is looking for his first win as a pro. As an amateur, Parra finished his run there with four-straight victories. Siscoe, a St. Charles native, began training at the famed Jackson-Winklejohn MMA gym in New Mexico. Diagnosed with Hodgkin's Lymphoma in 2015 and after extensive treatment, he was granted permission to return to the cage and that he did on December 2 at Shamrock FC: 279 with a submission win. Siscoe's recovery and return were the 2016 STL MMA Story of the Year. The Issac Purnell vs. Brandon Schehl bout originally slated for SFC: 295 has been pulled. The highlight of the undercard features a bantamweight bout that will determine the No. 1 contender slot in that division. Kory Beck will face off with Vince Hutchens, both of which are on a four-fight win streak. Beck is out of Springfield's Fusion MMA, and Hutchens, also fighting out of Springfield, IL is a tough prospect who loves to come forward and won't back down. There are quiet murmurs about Beck being a surprise up-and-coming talent. Kris Craig is coming off a devastating loss to Corbin Howard in the SFC flyweight title bout earlier this year. Avoran Graham is 2-1 and is coming off his first loss, after two impressive first round KO's. Austin Kunz, the son of STL MMA fan favorite Bo Kunz, makes his MMA debut against Sammy Burns. Burns, from Illinois, trains under Mark Chappel. Both David Grant and Kevin Mueller are former featherweights moving up to lightweight to face each other. Mueller, known for his groundwork, lost his bid for the SFC 145-pound title to Travon Crawford earlier this year. Grant has built his resume at the Lumiere shows and is making his first trip to River City. 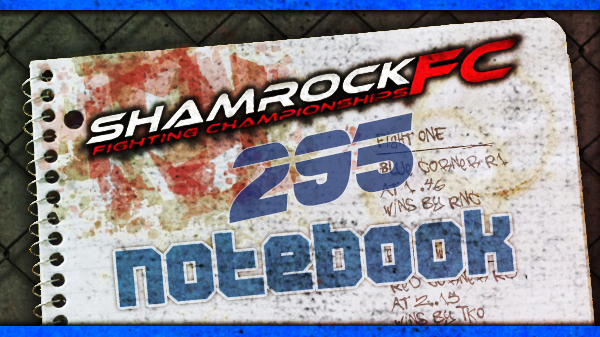 To watch SFC: 295 via pay-per-view, visit shamrockfightingchampionships.com. 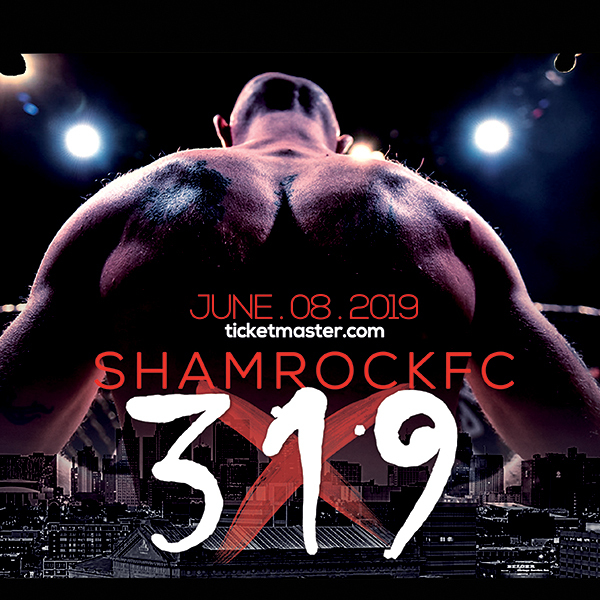 Weigh-ins are slated for today (Thursday) at the River City Casino with an opportunity to win hotel room, dinner for two and two tickets to SFC: 295 at the River City Casino & Hotel. To enter, you must be 21, and just show up at weigh-ins at 5 pm and enter the drawing.